MADERA, CALIFORNIA (June 9, 2016) – The first ever race for the 51FIFTY Jr. Late Models is part of tonight's episode of "Madera Racing" on MAVTV. The broadcast begins at 8pm eastern, 5pm pacific and also includes the Madera Winged Sprint Cars. All the action from the 2016 season at Madera Speedway in Madera, CA is broadcast on MAVTV channel 214 on DirecTV. 51FIFTY Jr. Late Models are the world's first full-sized pavement stock car series for drivers ages 10-16 years old. Tonight's broadcast is the historic first race for the series which took place on March 12th, 2016. Round #1 for the 2016 Madera Winged Sprints was on March 19th, 2016 and is also a part of this hour-long telecast. Next Thursday June 16th is Round #2 of the LoanMart Late Model Series, then Thursday June 23rd is Round #2 of the 51FIFTY Jr. Late Models plus the Pacific Challenge Series Super Late Models. Madera Racing on MAVTV airs every Thursday evening at 8pm eastern, 5pm pacific time. LEMOORE, CALIFORNIA (June 9, 2016) – The world's first ever Jr. Late Model Series makes its MAVTV television debut tonight and includes Team Silco's Ben Silliker in action. The broadcast airs at 5 p.m. Pacific Time / 8 p.m. Eastern on MAVTV on channel 214 on DirecTV. Silliker is an 11 year-old Northern Alberta, Canada transplant now residing in Lemoore, CA. 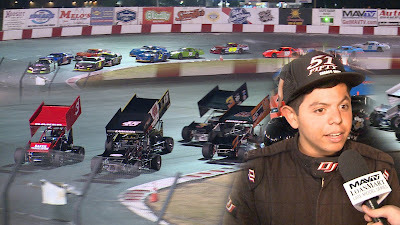 He is one of the youngest drivers in the series that is open to drivers ages 10-16 in full-sized pavement Late Models at Madera Speedway in Madera, CA. Madera Winged Sprint Cars also appear on the one-hour episode of "Madera Racing". Round #2 of the Jr. Late Models will air on Thursday June 23rd paired with the Pacific Challenge Series Super Late Models. Madera Racing on MAVTV airs every Thursday evening at 8pm eastern, 5pm pacific time. Team Silco Racing continues a busy 2016 campaign on Saturday racing Micro Sprints at Lemoore Raceway. More information on Team Silco Racing can be found at www.TeamSilco.com or on Facebook and Twitter. Team Silco Racing is presented by Hamblin Motorsports, Micro Blue Bearings, Evolution Racing Products, Blakesley Sports Media, CSI Shocks, Vahlco Wheels, and Motion Media Wraps. The All American Speedway will be once again presenting some traditional racing divisions that will appeal to all ages especially the old school fans. Providing the on track action this Saturday night will be the speedway's Street Stock, Bomber, F 4 and Hard Top divisions. The spectator gates will open at 4pm followed by racing at 6pm. General admission tickets for adults, age 16 to 59, are $10. Tickets for seniors, age 60 plus, and children, age 6 to 15, are $7. Children under 6 will be admitted free. The speedway also offers a budget friendly family pass, priced at $35, that admits two adults and three kids. Also, there's this reminder from the speedway regarding sign ups for the kids power wheel race to be held on Saturday, June 18th. This special event is open to kids age 3 to 8. To sign up, please send the following information to meganne.allamericanspeedway@gmail.com : child's name, child's age, child's hometown, car number and parent email. All sign ups are due by Wednesday, June 15th. A rare Sunday race is actually a make up date when club race #4 was rained out this past Saturday. This outstanding program features quarter midget racing, as well as driver development, for boys and girls 5 to 16 years old. The organization is sanctioned by region 11 of the Quarter Midgets of America. On Sunday race day there will be a pit meeting at 9am. Past that point, the track goes hot with a practice session. qualifying and main events. Participating race division include: JR Novice, SR Animal, SR Honda, LT 160 and LT World Formula. The 1/20 mile track is located at the front portion of the Madera Speedway pit road. The IEC will be treating their fans to action from the NASCAR Whelen All American Series this Saturday night led by the Pick Your Part Late Models who will be racing in twin main events. Already at the half way point of the season, Trevor Huddleston leads the division's points standings based on six feature wins in ten starts. Christian McGhee is ranked second in the championship standings with two wins and six runner up finishes. Going into Saturday night, and the second half of the season, there are only six points separating these two drivers. Also providing the exciting on track action will be the Bandloeros, Legends, RACECAR Factory Spec Late Models presented by Sharky's Eco Diving and the Seidner's Collision Centers Irwindale Race Trucks. The spectator gates will open at 4pm followed by the popular on track autograph session at 545pm with the green flag falling on the first event of the evening at 7pm. Adult pre sale tickets are $10 and are available online or at the speedway office. Otherwise, adult tickets will be $15 at the ticket gate on Saturday, race day. Children's ticket are $5. Furia Motorsports, the management at Lakeport, will be presenting racing with an old school retro theme this Saturday night. Providing the racing excitement will be the Bomber, Jalopy, Jammer, Legend and Bandolero divisions. The spectator gates will open at 330pm followed by qualifying at 5pm and then on to the race program. General admission tickets are $12. Tickets for seniors, age 60 plus, and students, with valid ID, are $9. Tickets for children, age 5 to 11, are $6 while toddlers and infants will be admitted free. In their continuous effort to show appreciation for community first responders, their tickets, with valid ID, are value priced at $6. The speedway also offers a budget friendly family pack, priced at $30 that admits two adults and three children. This is, without question, the hottest ticket of the weekend and there's two reasons for that. First, the management and staff are extremely good at their jobs and for years has produced high quality shows that gives their fans more bang for their buck. Second, Saturday's night show is being billed as the Lucas Oil Summertime Horse Power Nationals with the headliners being the always exciting Lucas Oil Modified Racing Series, presented by 1 800 Loan Mart. The famed modified series will be running the Lucas Oil California Farmers 75, presented by Protect The Harvest. That's 75 green flag laps with a starting field of 24 cars featuring some of the best driving talent from the west coast area. Also on the Madera race agenda will be the North State Modifieds running a 60 lap main, the MAV TV Western Winged Super Sprints, the USAC HPD Midgets and the Legends of the Kearney Bowl. Practice and qualifying will begin at 2pm with the grandstands open for spectators. The ticket gate will open at 330pm. Heat races will commence at 4pm followed by opening ceremonies and main events at 630pm. Make sure you wave at the cameras. The Lucas Oil Production Studios will be on hand to film the Lucas Oil Modifieds and Western Winged Super Sprints for a future national television broadcast on MAV TV. General admission tickets for adults are $20 and $17 for seniors. Kids tickets, age 6 to 12, are $10 with kids five and under admitted free. The battle for the track championships in Redwood Acres Raceway’s six divisions is still up in the air. With the season nearly a quarter of the way done there are a lot of things that can change between this weekend’s upcoming race on June 11th and the final point races in September. Redwood Acres Raceway’s newest division, the Legends are picking up cars as the season progresses. Current point leader, Brent Mack has managed to be the only driver to be able to start each of the four feature events this season and holds a commanding 28 point lead. Former Thunder Roadster racer, Robert Miller has used his experience to move into second. Brad Curtice is a point behind Miller in third while his daughter, Anissa Curtice is fourth only three markers behind. Denny Hadler, Jr. finished second in the most recent main event on May 29th and rounds out the top five in the standings. Experience is paying off for Steve Paiment who leads the standings for the California State & Federal Employees Credit Union roadrunner division. Tyler Peach holds down second in the point standings and is 14 points behind Paiment. Bethany Rapp lies third and is an additional 13 points behind second place, Peach. Fourth position features a tie between Jennifer Murrell and Patrick Sproul. Only two points separate first and second in the Fortuna Wheel & Brake bomber division. Tyler Avelar has been a force in the division in 2016 and leads the standings but James Moore is right on his heels in second. Ryan Ahrens is third but 39 points behind Avelar. John Lally is fourth in the standings, seven points behind Ahrens while Kim Sorrels is fifth. With two main event victories in 2016, Jarrett Mayo leads the chase for the championship in the Humboldt Hydroponics mini stock class. Mayo’s advantage is 10 points over second place, Gary Klinetobe. Eugene Palmer is third and 11 points behind Mayo while Daniel Buell is farther back in fourth, 22 points behind Mayo. Brian Murrell, Sr. is fifth in points and 35 markers behind the leaders. Another Acres veteran who has put his experience to good use in 2016 is Tommy Payne. The former Thunder Roadster champion is looking to add another to his resume and leads second place Ronnie O’Neil by nine points. Aaron Byers is third in the standings and still within sight of Payne as he’s 12 points behind. Fourth is Donnie Brown who is a single point behind third. LeRoy Marsh, Jr. rounds out the top five, 28 points behind Payne. The Mid City Motor World late models have been off for nearly a month and it should be interesting this Saturday to see how the break has affected the drivers and teams in the division. Only fifteen points separate first to fifth in the standings with Mic Moulton leading second place, Marty Walsh by two points. Racing legend, Jim Walker is third and four points behind Moulton. Jedd Ambrosini is fourth while Kenny Demello rounds out the top five. Furia plans to run Madera this weekend making her North State Modified debut. “I am excited to run with this series this coming weekend. I am out there to make laps and learn” explained Furia. Not only will she be making laps, she has high hopes to come out on top. Furia has had a long line of wins in the Modified in her hometown along with multiple wins in many other divisions. 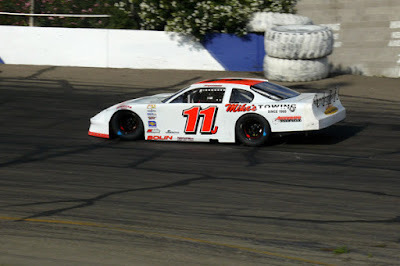 Furia will be racing with the North State Modifieds in July at her home track of Ukiah Speedway. “I have hopes that we will come out on top here at our home track, and show the fans that we can pull it off” said Furia. Last season, Furia had plans to run full-time with PCS, Pacific Challenge Series for her 2016 series, but the plans got cut short with a violent wreck last July. This resulted in Furia having a totaled Late Model and also, injuries to the shoulder. Furia had explained, “It was scary for not only me, but everyone around me. I have never been put in the situation I was in before and I would never want to have to be there again”. Furia does have plans to make some races with the PCS series, once the new car is finished. “I loved being able to race against some of my closest friends with the PCS series, such as hometown favorite Jeremy Doss. We have been friends since we could race and never stopped from that point” explained Furia. Furia has a longline of support and it is great to see the support coming from all over. Be on the look out for Furia at Madera Speedway with the North State Modified series. 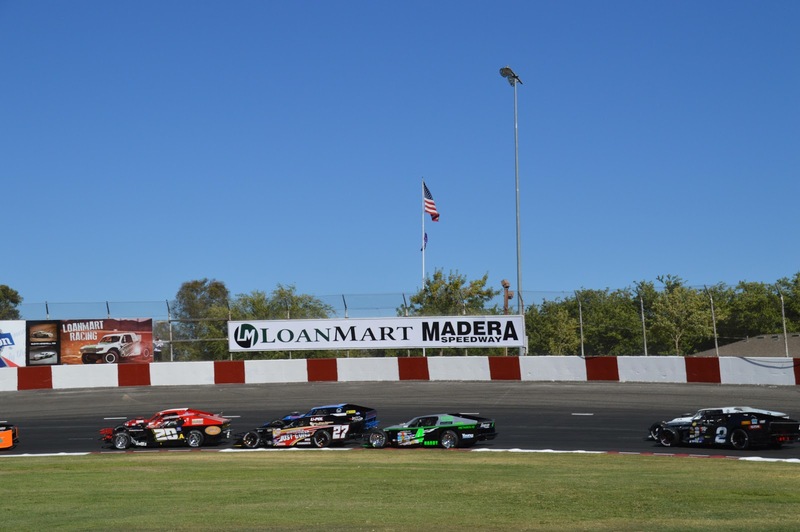 MADERA, CALIFORNIA (June 6, 2016) – One of the largest open wheel races each year at LoanMart Madera Speedway invades the "Fastest 1/3rd Mile in the West" this Saturday night with the Lucas Oil Summertime Horsepower Nationals. This is a complete festival of open wheel speed and excitement. The Lucas Oil Modifieds 75, North State Modifieds 60, and Madera Western Winged Super Sprints headline the racing along with USAC HPD Midgets and Legends of Kearney Bowl. The Lucas Oil Modifieds visit Madera twice annually and return on October 8th as part of the Short Track Shootout with a $5,000 to win feature that night. Large car counts are the name of the game with this series and a 40 lap B Main is scheduled as well. Former Madera track champion Scott Winters and Lake County's Kyle Tellstrom split the 2015 Lucas Oil races at Madera. Linny White has won twice this season with Ryan Partridge and Travis Thirkettle also seeing victory lane so far this year. Matthew Hicks leads Tellstrom, Aaron McMorran, Winters, and Taylor Miinch in the standings. On the North State Modified side, last season's appearance at the Horsepower Nationals was their debut at the facility. 2015 champion Darrin Knight won the most recent series race at Redwood Acres Raceway in Eureka, CA while Mike Collins leads the points. Tripp Gaylord won the series debut at the track last June but is not running in 2016 making for a wide-open field. The series also races with the Pacific Challenge Series Super Late Models at Madera on August 13th. The Madera Western Winged Super Sprints are the fastest cars at LoanMart Madera Speedway with speeds over 110 miles per hour on the straightaways. Chowchilla's Eric Humphries has been perfect this year scoring a pair of victories to start the season to lead the points. Tom Baker debuted a new car this season and has runs of fourth and second to rank second in the order. Long time crew member and NCMA Sprint Car driver Justin Kawahata graduated to the wings and has found his footing for third place in the championship. Mr. Excitement Anthony Simone and USAC HPD Midget graduate Dylan Noble round out the top-five. The MAVTV television debut for the Western Winged Sprints is this Thursday night at 5 p.m. Pacific / 8 p.m. Eastern. 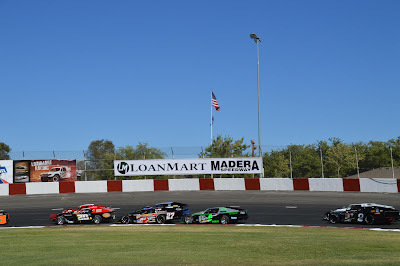 They are paired with the world's first ever race for the 51FIFTY Jr. Late Models as part of the second episode of the "Madera Racing" program. Both the Lucas Oil Modifieds and Western Winged Sprints races on Saturday will air on MAVTV at a later date. The Lucas Oil Summertime Nationals will be getting a big dose of television exposure for the teams and sponsors competing. A contrast of young and old, Saturday's under card sees the youth drivers in the USAC HPD Midgets with a 30 lap feature scheduled for the western United States touring series. The fan favorite Legends of Kearney Bowl presents vintage Super Modified action that can only be seen to believe. Car counts for the LKB routinely exceed 20 cars with split features based on drivers speed and experience level. Adult tickets are $20, seniors $17, youth ages 6-12 $10, and kids five and under are free. Grandstands are open for practice before ticket sales begin at 3:30 p.m. Qualifying begins at 2 p.m. with the first heat races at 4 p.m. Opening ceremonies are at 6:30 p.m. with main events to follow. More information on the LoanMart Madera Speedway is available at www.RaceMadera.com the speedway is located at the Madera Fairgrounds at 1850 West Cleveland Ave. The Event Hotline is 559-673-RACE. Madera only races twice this month but they are a pair of large shows. Following the Lucas Oil Summertime Horsepower Nationals, the LoanMart Open Late Models and 51FIFTY Jr. Late Models return for more MAVTV-televised racing on June 18th. ANDERSON, CALIFORNIA (June 4, 2016) - A wild win in the Wild Wild West for Tracy Bolin on Saturday night, as the Valley Springs, CA native survived a late challenge from Jeremy Doss to win at Shasta Speedway. The 100 lap Pacific Challenge Series feature was presented by PenneyLawyers.com The race had many twists and turns on a hot 100 degree night at the 3/8ths mile speedway in Anderson, CA. Bolin's win propels him to fourth in the PCS standings while Doss extended his points lead with a hard-earned second place effort. The series has not yet had a repeat winner in five races and has broken the track record in four of five. Eric Schmidt looked to be in position for his second straight series victory after winning the American Racer Tire dash to start on the pole position on a 19 car field. Schmidt was one of three drivers underneath the track record including Cole Moore and new track recorder holder Jeremy Doss with a 15.449 second lap. Doss led the opening lap of competition from the outside pole before Schmidt edged forward. Doss tried the over under move into turn three to dive into the bottom. Schmidt was able to drive out to maintain the top spot through laps two and three. The leaders darted in and out of lapped traffic with Bolin a few car lengths back. Doss closed back in on Schmidt on lap 15 as traffic intensified. Anderson's Derek Copeland started ninth and was up to seventh by quarter race distance. JR Courage anchored a four car pack from 12th in front of the leaders before spinning on lap 24 for the race's first caution. On the restart Schmidt picked the inside line and lost the lead position briefly to Doss when the caution came out again on lap 26 for Trevor Harrison stalled on the backstretch. Doss was credited with lap 26 in the lead but Schmidt promptly took it back on the restart as the pair scrambled for the bottom positioning. Schmidt finally started to put distance on Doss by lap 31. John Moore got shuffled out of the top-five and Copeland started to emerge in the top-five when the halfway break hit on lap 50. Coming out of the break saw Schmidt continue to lead Doss and Bolin. John Moore made bold moves to overhaul both Copeland and Cole Moore from the outside line to get to fourth. The race's punctuation mark occurred on lap 77 when Schmidt and Doss got tangled on a restart down the backstretch. Schmidt was hooked right hard into the turn three wall head-on and slightly airborne. John Moore suffered front end damage trying to avoid the incident as well. Schmidt was uninjured but done for the night after the violent crash, handing the lead to Tracy Bolin when Doss was sent to the rear for his involvement. Oregon's David Miller and Mike Sackett along with Courage had a tremendous battle for the fourth position that included Miller and Courage coming together on lap 78 for a caution. Doss navigated through the battle and then made his way past Cole Moore to take second. The hard battle hit its climax on lap 95 while Doss chased Bolin closely. Despite Sackett and Courage spinning in turn four and debris on the inside of the track, the race stayed green. Bolin slowed dramatically through the dust and was hard hit in the back by Doss but both continued. 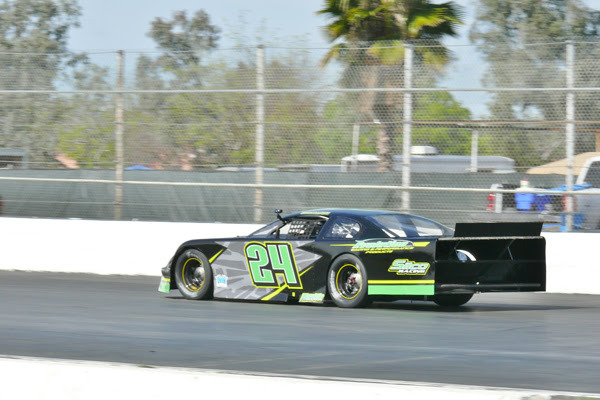 The Pacific Challenge Series returns to All American Speedway for its second of four appearances at the one-third mile oval in Roseville, CA on June 25th. PCS will be joined by the North State Modified Series for a double-header of touring excitement. Lap leaders: #75 Jeremy Doss 1, #05 Eric Schmidt 2-25, Doss 26, Schmidt 27-77, #11j Tracy Bolin 78-100.